People often describe flying in to Reykjavik as akin to landing on the moon. With it’s barren volcanic landscape, Iceland is truly a land of extremes. Despite its modest size, the island hosts a spectacular array of scenery and a huge amount of challenging hikes and climbs. With vast icecaps dominating it’s centre, hot springs, rocky peaks and lush valleys, it is a unique place to take an adventurous journey. This short itinerary includes ascents of two mountains, as well as an ice climbing lesson on the glacier and a dip in the famous Blue Lagoon. Iceland has a wonderful variety of places to stay, and as with all of our trips, we hand pick a selection of the best. From beautiful lodges in the wilderness, large expedition dome tents on overnight treks and luxury boutique hotels in the city. On arrival at Keflavík International airport you will be greeted by your guide that will take you along the south coast to the Sólheimajökull outlet glacier. 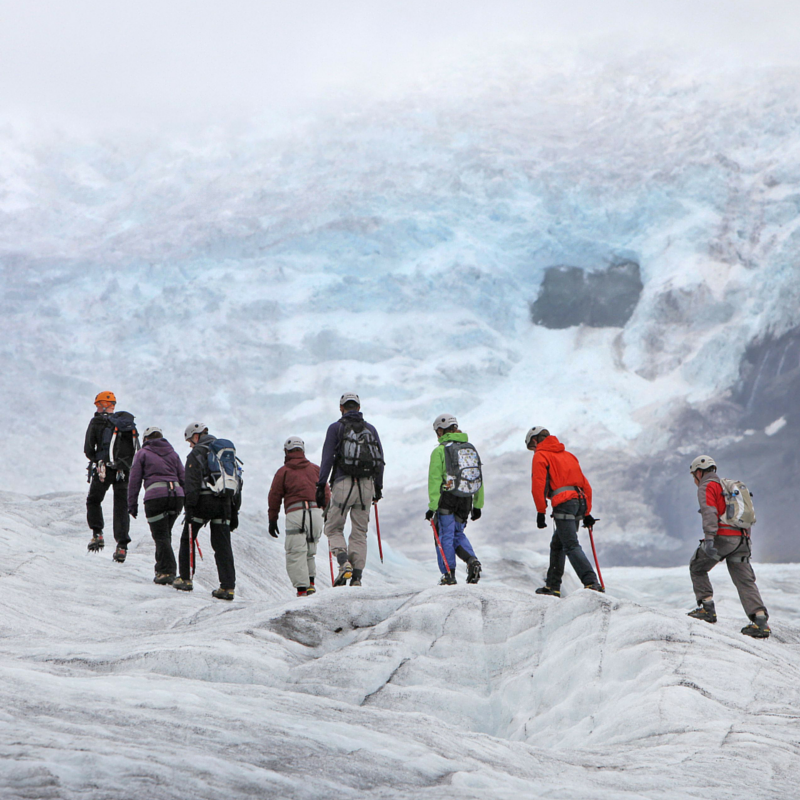 The outlet glacier is located between the ice caps Eyjafjallajökull and Mýrdalsjökull and here fully qualified guides will take you ice climbing. After some great fun scaling the walls of ice you head to a comfortable country hotel where you spend the night. Possibilities of Northern Lights viewing in the night. After breakfast you head to the Hengill volcano, located to the South of Lake Þingvallavatn. The drive takes you through the southern farmlands and to the Northern tip of the volcano where you will start the hike. At Dyradalur valley we get out of the bus and set out for the hike to the summit of the volcano. After a short walk up the valley we start the ascent up the slopes to the summit. From the summit we have amazing views north over Lake þingvallavatn and all the way to the Langjökull ice cap. After enjoying the views we descend down to the vehicle and drive to Reykjavík and a comfortable hotel for the next 2 nights. Today we drive a short distance to the foothills of the Reykjavík city mountain Mt Esja, right across the bay. There are many different routes available up and down this great mountain where some of the city folks make their regular training instead of in an indoor gym. After our day on the mountain we head back to the city and return to the hotel for the night. Dinner at one of the great local restaurants. You can enjoy a leisurely morning until your guides come by to pick you up for the transfer to the airport. En route we stop at the Blue Lagoon to soak in the healing waters of this magical spa. The tour ends with your guide dropping you off at the airport in time for your check in. There are countless treks and challenges which we can offer in Iceland, so please contact us for more details. Iceland enjoys long seasons, however the winter months are significantly colder with low temperatures and short daylight hours. The Northern Lights are most visible from October to April. This example programme involves ascents of two mountains, however the terrain is not technical and they are suitable for walkers with good basic fitness.